You are currently browsing the archives for the Chapter III: Land category. The sun has returned. To-day it seemed better than ever and the glare was blinding. There are quite a number of cases of snow blindness. We have done splendidly. To-night all the provisions except some in bottles are ashore and nearly all the working paraphernalia of the scientific people – no light item. There remains some hut furniture, 2 1/2 tons of carbide, some bottled stuff, and some odds and ends which should occupy only part of to-morrow; then we come to the two last and heaviest items – coal and horse fodder. If we are not through in the week we shall be very near it. 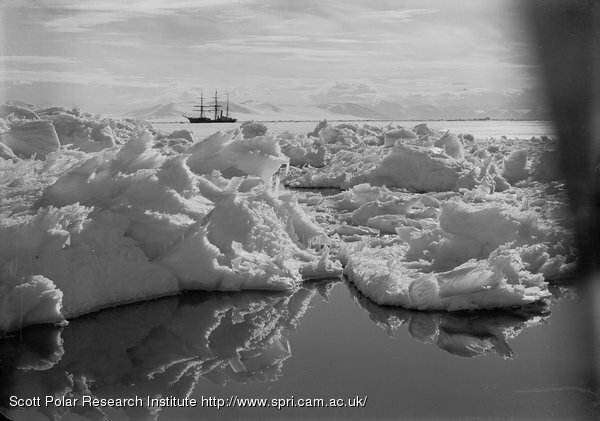 Meanwhile the ship is able to lay at the ice edge without steam; a splendid saving. There has been a steady stream of cases passing along the shore route all day and transport arrangements are hourly improving. Two parties of four and three officers made ten journeys each, covering over 25 miles and dragging loads one way which averaged 250 to 300 lbs. per man. The ponies are working well now, but beginning to give some excitement. On the whole they are fairly quiet beasts, but they get restive with their loads, mainly but indirectly owing to the smoothness of the ice. They know perfectly well that the swingle trees and traces are hanging about their hocks and hate it. (I imagine it gives them the nervous feeling that they are going to be carried off their feet.) This makes it hard to start them, and when going they seem to appreciate the fact that the sledges will overrun them should they hesitate or stop. The result is that they are constantly fretful and the more nervous ones tend to become refractory and unmanageable. Oates is splendid with them – I do not know what we should do without him. I did seven journeys with ponies and got off with a bump on the head and some scratches. 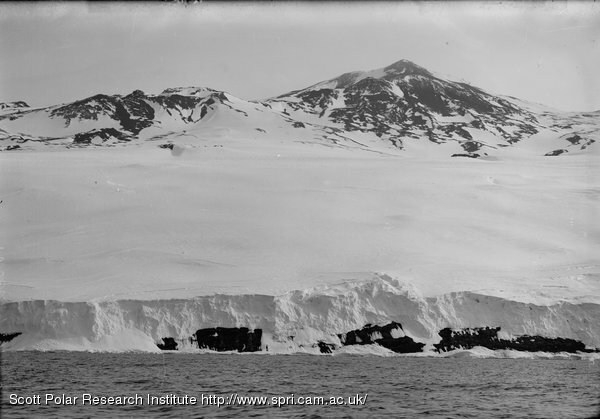 One pony got away from Debenham close to the ship, and galloped the whole way in with its load behind; the load capsized just off the shore and the animal and sledge dashed into the station. Oates very wisely took this pony straight back for another load. Two or three ponies got away as they were being harnessed, and careered up the hill again. 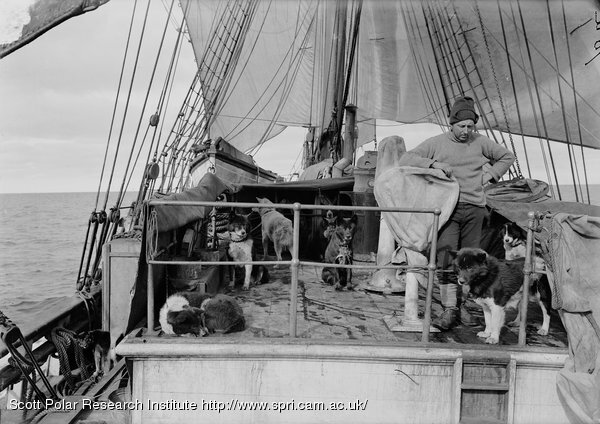 In fact there were quite a lot of minor incidents which seemed to endanger life and limb to the animals if not the men, but which all ended safely. One of Meares’ dog teams ran away – one poor dog got turned over at the start and couldn’t get up again (Muk/aka). He was dragged at a gallop for nearly half a mile; I gave him up as dead, but apparently he was very little hurt. The ponies are certainly going to keep things lively as time goes on and they get fresher. Even as it is, their condition can’t be half as bad as we imagined; the runaway pony wasn’t much done even after the extra trip. The station is beginning to assume the appearance of an orderly camp. We continue to find advantages in the situation; the long level beach has enabled Bowers to arrange his stores in the most systematic manner. Everything will be handy and there will never be a doubt as to the position of a case when it is wanted. The hut is advancing apace – already the matchboarding is being put on. The framework is being clothed. It should be extraordinarily warm and comfortable, for in addition to this double coating of insulation, dry seaweed in quilted sacking, I propose to stack the pony fodder all around it. I am wondering how we shall stable the ponies in the winter. 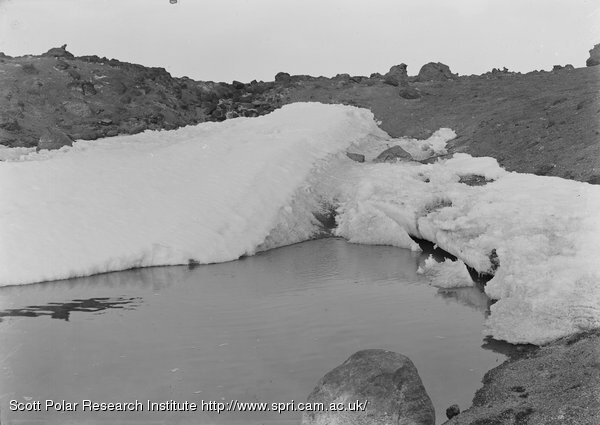 The only drawback to the present position is that the ice is getting thin and sludgy in the cracks and on some of the floes. The ponies drop their feet through, but most of them have evidently been accustomed to something of the sort; they make no fuss about it. Everything points to the desirability of the haste which we are making – so we go on to-morrow, Sunday. A whole host of minor ills besides snow blindness have come upon us. Sore faces and lips, blistered feet, cuts and abrasions; there are few without some troublesome ailment, but, of course, such things are ‘part of the business.’ The soles of my feet are infernally sore. Ponting had an alarming adventure about this time. 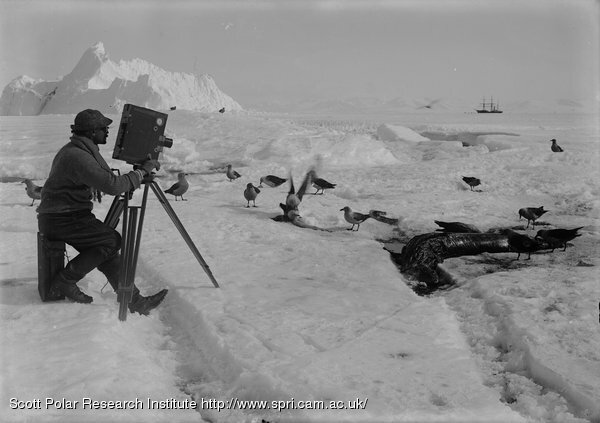 Bent on getting artistic photographs with striking objects, such as hummocked floes or reflecting water, in the foreground, he used to depart with his own small sledge laden with cameras and cinematograph to journey alone to the grounded icebergs. One morning as he tramped along harnessed to his sledge, his snow glasses clouded with the mist of perspiration, he suddenly felt the ice giving under his feet. He describes the sensation as the worst he ever experienced, and one can well believe it; there was no one near to have lent assistance had he gone through. 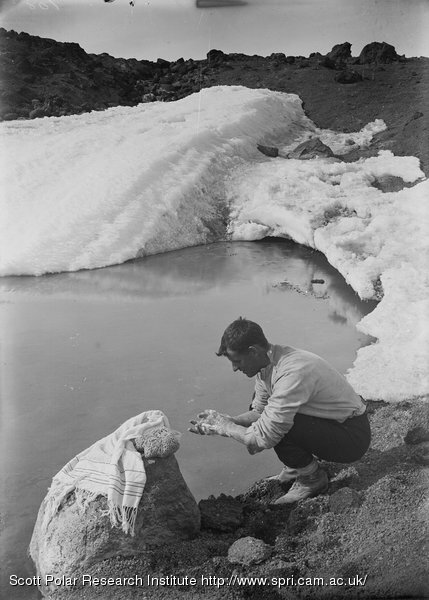 Instinctively he plunged forward, the ice giving at every step and the sledge dragging through water. Providentially the weak area he had struck was very limited, and in a minute or two he pulled out on a firm surface. He remarked that he was perspiring very freely! Looking back it is easy to see that we were terribly incautious in our treatment of this decaying ice. We got to work at 6 again this morning. 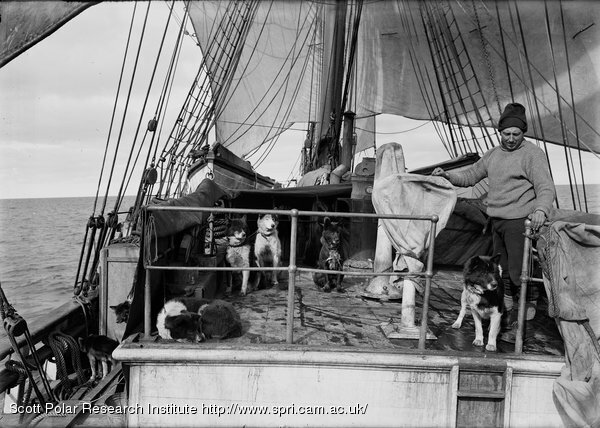 Wilson, Atkinson, Cherry-Garrard, and I took each a pony, returned to the ship, and brought a load ashore; we then changed ponies and repeated the process. We each took three ponies in the morning, and I took one in the afternoon. 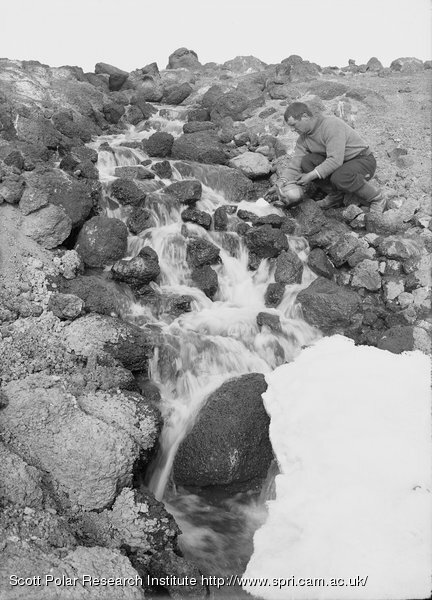 Bruce, after relief by Rennick, took one in the morning and one in the afternoon – of the remaining five Oates deemed two unfit for work and three requiring some breaking in before getting to serious business. I was astonished at the strength of the beasts I handled; three out of the four pulled hard the whole time and gave me much exercise. I brought back loads of 700 lbs. and on one occasion over 1000 lbs. With ponies, motor sledges, dogs, and men parties we have done an excellent day of transporting–another such day should practically finish all the stores and leave only fuel and fodder (60 tons) to complete our landing. So far it has been remarkably expeditious. The motor sledges are working well, but not very well; the small difficulties will be got over, but I rather fear they will never draw the loads we expect of them. Still they promise to be a help, and they are lively and attractive features of our present scene as they drone along over the floe. At a little distance, without silencers, they sound exactly like threshing machines. 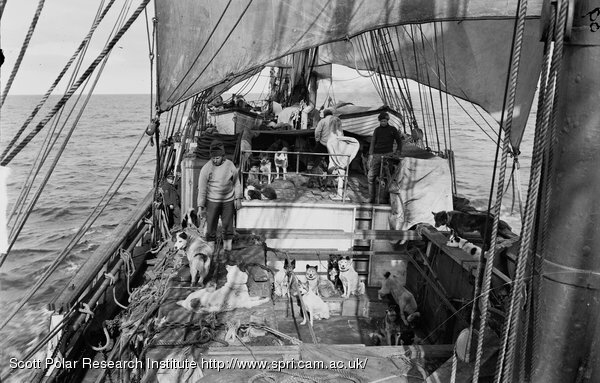 The dogs are getting better, but they only take very light loads still and get back from each journey pretty dead beat. In their present state they don’t inspire confidence, but the hot weather is much against them. The men parties have done splendidly. Campbell and his Eastern Party made eight journeys in the day, a distance over 24 miles. Everyone declares that the ski sticks greatly help pulling; it is surprising that we never thought of using them before. Atkinson is very bad with snow blindness to-night; also Bruce. Others have a touch of the same disease. It’s well for people to get experience of the necessity of safeguarding their eyes. The only thing which troubles me at present is the wear on our sledges owing to the hard ice. No great harm has been done so far, thanks to the excellent wood of which the runners are made, but we can’t afford to have them worn. 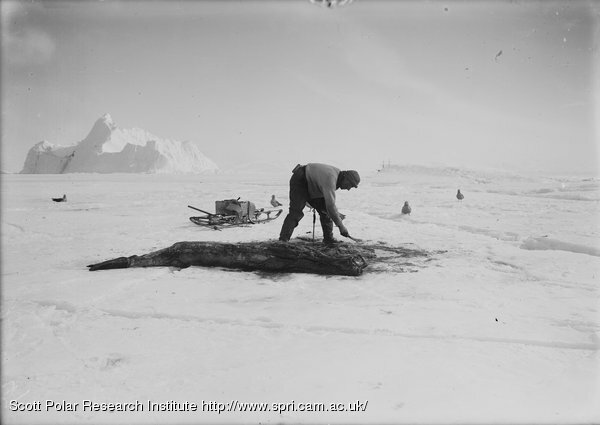 Wilson carried out a suggestion of his own to-night by covering the runners of a 9-ft. sledge with strips from the skin of a seal which he killed and flensed for the purpose. I shouldn’t wonder if this acted well, and if it does we will cover more sledges in a similar manner. We shall also try Day’s new under-runners to-morrow. After 48 hours of brilliant sunshine we have a haze over the sky. To-day I walked over our peninsula to see what the southern side was like. 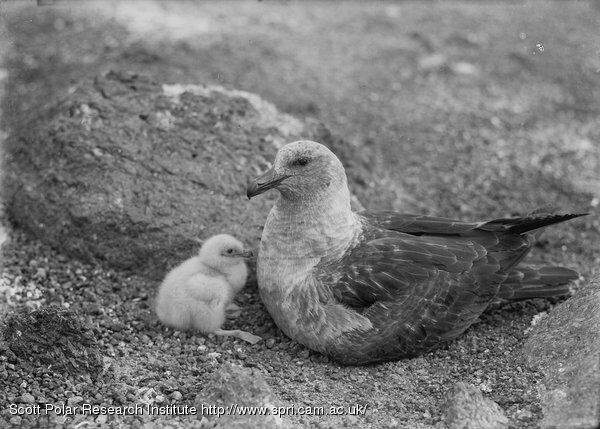 Hundreds of skuas were nesting and attacked in the usual manner as I passed. 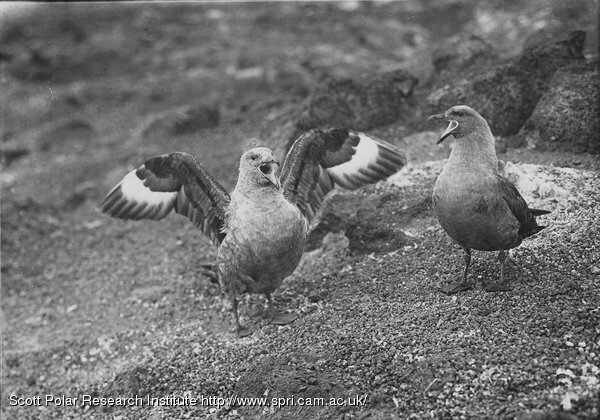 They fly round shrieking wildly until they have gained some altitude. They then swoop down with great impetus directly at one’s head, lifting again when within a foot of it. The bolder ones actually beat on one’s head with their wings as they pass. At first it is alarming, but experience shows that they never strike except with their wings. 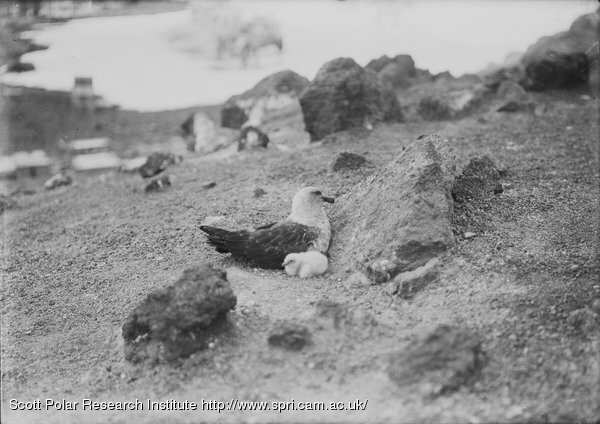 A skua is nesting on a rock between the ponies and the dogs. 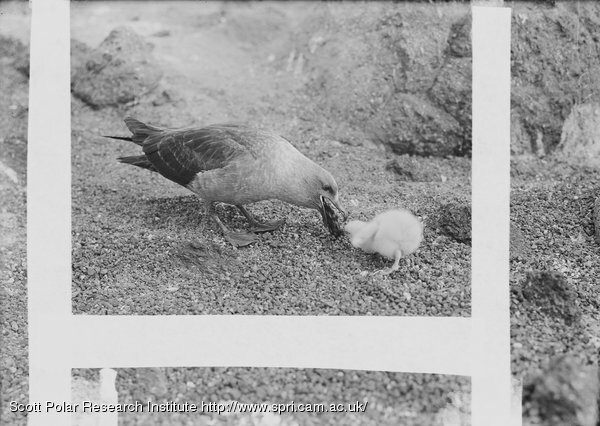 People pass every few minutes within a pace or two, yet the old bird has not deserted its chick. In fact, it seems gradually to be getting confidence, for it no longer attempts to swoop at the intruder. 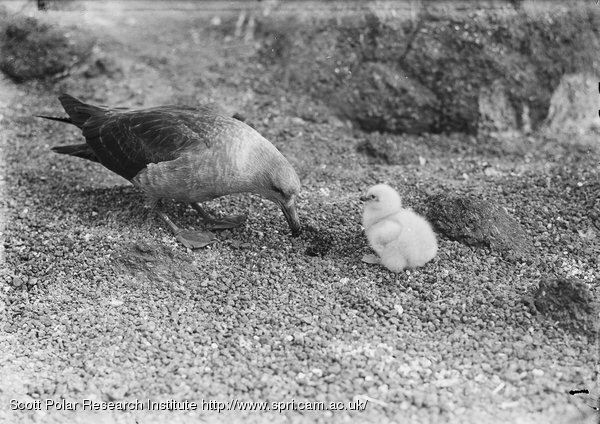 To-day Ponting went within a few feet, and by dint of patience managed to get some wonderful cinematograph pictures of its movements in feeding and tending its chick, as well as some photographs of these events at critical times. The main channel for thaw water at Cape Evans is now quite a rushing stream. Evans, Pennell, and Rennick have got sight for meridian distance; we ought to get a good longitude fix. All hands were up at 5 this morning and at work at 6. Words cannot express the splendid way in which everyone works and gradually the work gets organised. I was a little late on the scene this morning, and thereby witnessed a most extraordinary scene. 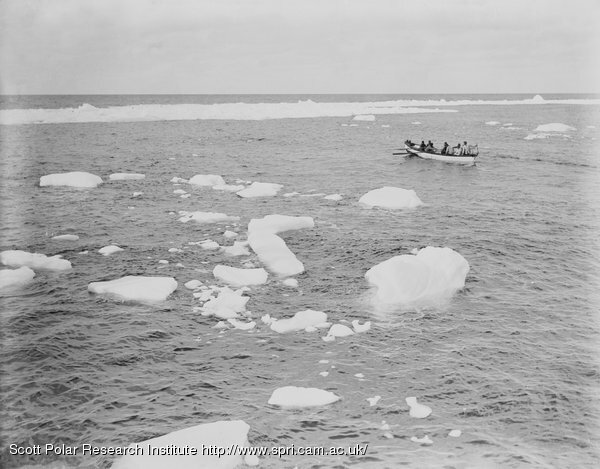 Some 6 or 7 killer whales, old and young, were skirting the fast floe edge ahead of the ship; they seemed excited and dived rapidly, almost touching the floe. As we watched, they suddenly appeared astern, raising their snouts out of water. I had heard weird stories of these beasts, but had never associated serious danger with them. 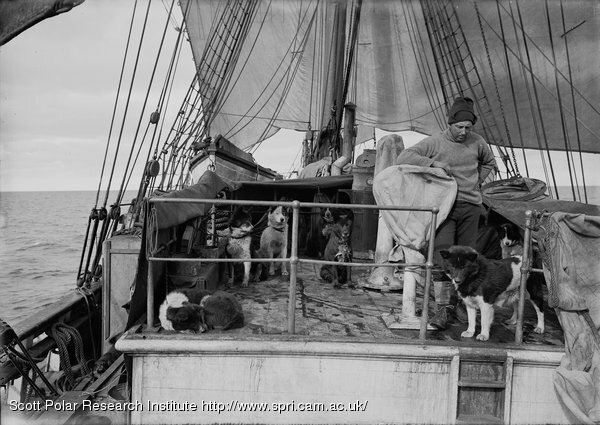 Close to the water’s edge lay the wire stern rope of the ship, and our two Esquimaux dogs were tethered to this. I did not think of connecting the movements of the whales with this fact, and seeing them so close I shouted to Ponting, who was standing abreast of the ship. 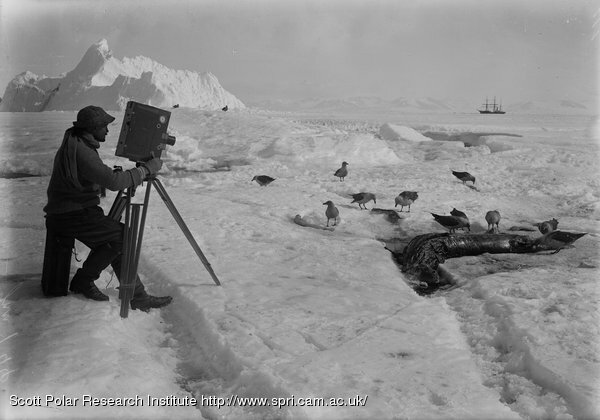 He seized his camera and ran towards the floe edge to get a close picture of the beasts, which had momentarily disappeared. The next moment the whole floe under him and the dogs heaved up and split into fragments. One could hear the ‘booming’ noise as the whales rose under the ice and struck it with their backs. Whale after whale rose under the ice, setting it rocking fiercely; luckily Ponting kept his feet and was able to fly to security. By an extraordinary chance also, the splits had been made around and between the dogs, so that neither of them fell into the water. Then it was clear that the whales shared our astonishment, for one after another their huge hideous heads shot vertically into the air through the cracks which they had made. As they reared them to a height of 6 or 8 feet it was possible to see their tawny head markings, their small glistening eyes, and their terrible array of teeth–by far the largest and most terrifying in the world. There cannot be a doubt that they looked up to see what had happened to Ponting and the dogs. 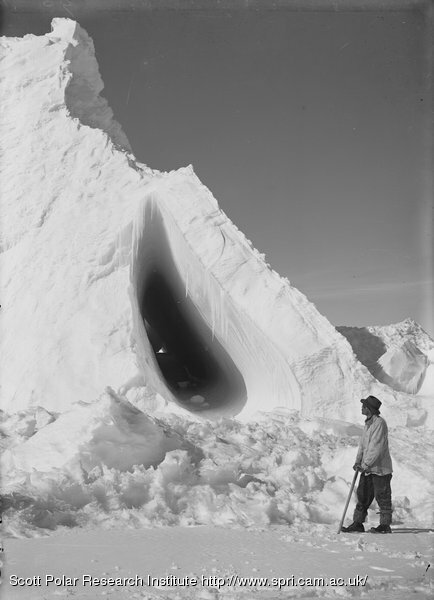 After this, whether they thought the game insignificant, or whether they missed Ponting is uncertain, but the terrifying creatures passed on to other hunting grounds, and we were able to rescue the dogs, and what was even more important, our petrol – 5 or 6 tons of which was waiting on a piece of ice which was not split away from the main mass. One killed at Greenwich, 31 feet. Teeth about 2 1/2 inches above jaw; about 3 1/2 inches total length. 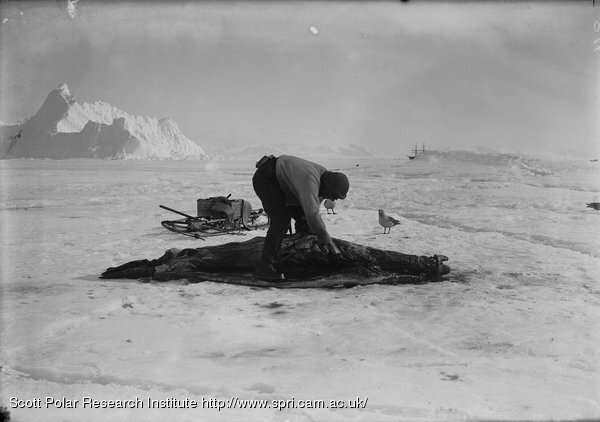 In stomach of a 21 ft. specimen were found remains of 13 porpoises and 14 seals. A herd of white whales has been seen driven into a bay and literally torn to pieces. Teeth, large, conical, and slightly recurred, 11 or 12 on each side of either jaw. Adult males average 20 feet; females 15 feet. Strong sharp conical teeth which interlock. Combines great strength with agility. Habits exhibit a boldness and cunning peculiar to their carnivorous propensities. 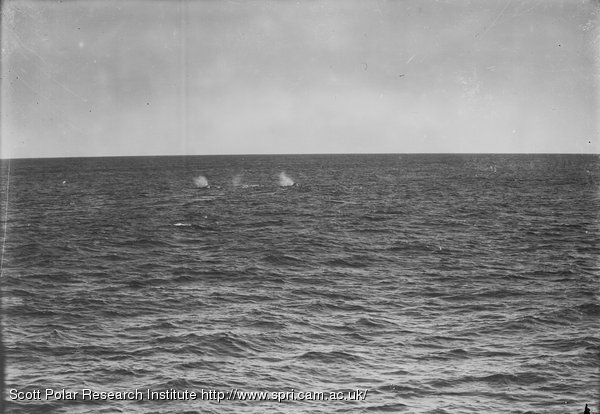 Three or four do not hesitate to grapple the largest baleen whales, who become paralysed with terror – frequently evince no efforts to escape. Instances have occurred where a band of orcas laid siege to whales in tow, and although frequently lanced and cut with boat spades, made away with their prey. Inclined to believe it rarely attacks larger cetaceans. Sometimes seen peering above the surface with a seal in their bristling jaws, shaking and crushing their victims and swallowing them apparently with gusto. Tear white whales into pieces. 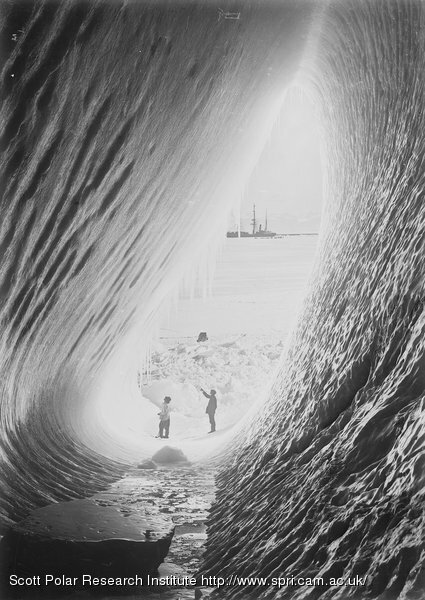 Ponting has been ravished yesterday by a view of the ship seen from a big cave in an iceberg, and wished to get pictures of it. He succeeded in getting some splendid plates. 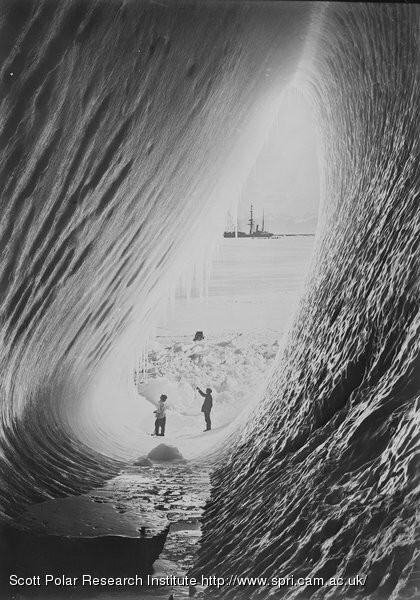 This fore-noon I went to the iceberg with him and agreed that I had rarely seen anything more beautiful than this cave. 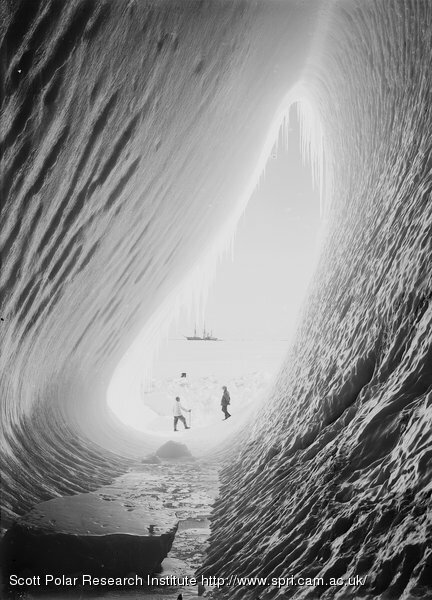 It was really a sort of crevasse in a tilted berg parallel to the original surface; the strata on either side had bent outwards; through the back the sky could be seen through a screen of beautiful icicles–it looked a royal purple, whether by contrast with the blue of the cavern or whether from optical illusion I do not know. 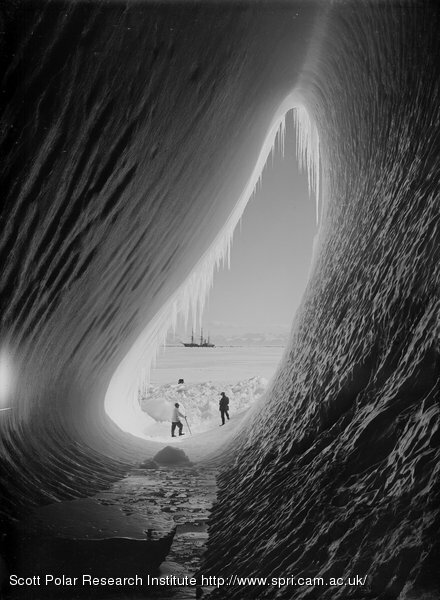 Through the larger entrance could be seen, also partly through icicles, the ship, the Western Mountains, and a lilac sky; a wonderfully beautiful picture. Ponting is simply entranced with this view of Mt. 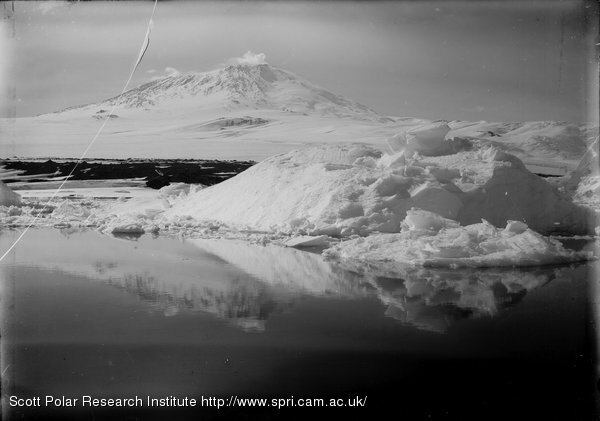 Erebus, and with the two bergs in the foreground and some volunteers he works up foregrounds to complete his picture of it. I go to bed very satisfied with the day’s work, but hoping for better results with the improved organisation and familiarity with the work. To-day we landed the remainder of the woodwork of the hut, all the petrol, paraffin and oil of all descriptions, and a quantity of oats for the ponies besides odds and ends. The ponies are to begin work to-morrow; they did nothing to-day, but the motor sledges did well–they are steadying down to their work and made nothing but non-stop runs to-day. One begins to believe they will be reliable, but I am still fearing that they will not take such heavy loads as we hoped. Day is very pleased and thinks he’s going to do wonders, and Nelson shares his optimism. The dogs find the day work terribly heavy and Meares is going to put them on to night work. The framework of the hut is nearly up; the hands worked till 1 A.M. this morning and were at it again at 7 A.M. – an instance of the spirit which actuates everyone. The men teams formed of the after-guard brought in good loads, but they are not yet in condition. The hut is about 11 or 12 feet above the water as far as I can judge. I don’t think spray can get so high in such a sheltered spot even if we get a northerly gale when the sea is open. In all other respects the situation is admirable. This work makes one very tired for Diary-writing. This work is full of surprises. At 6 A.M. we came through the last of the Strait pack some three miles north of Cape Royds. 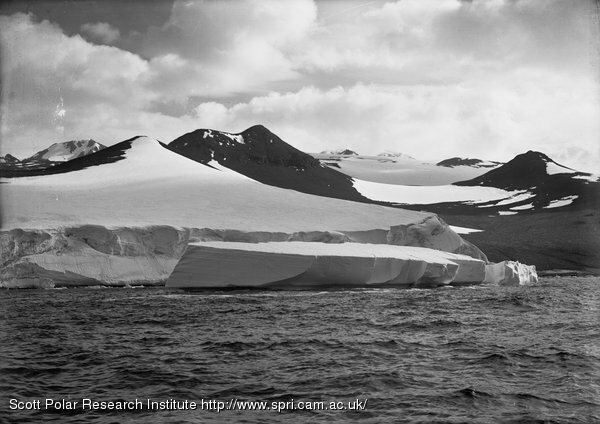 We steered for the Cape, fully expecting to find the edge of the pack ice ranging westward from it. To our astonishment we ran on past the Cape with clear water or thin sludge ice on all sides of us. 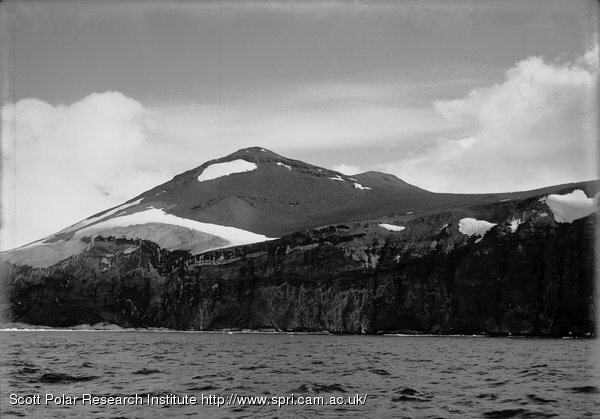 Past Cape Royds, past Cape Barne, past the glacier on its south side, and finally round and past Inaccessible Island, a good 2 miles south of Cape Royds. 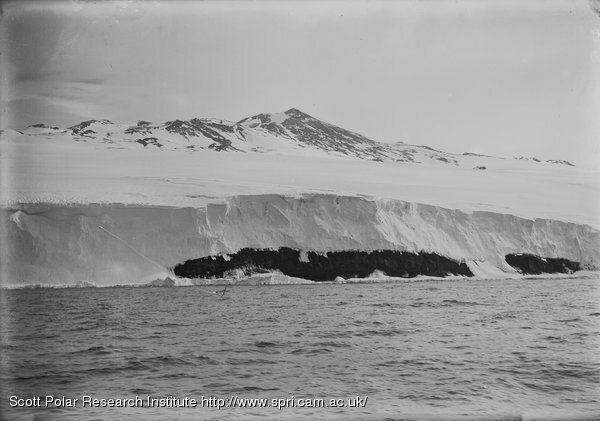 ‘The Cape itself was cut off from the south.’ We could have gone farther, but the last sludge ice seemed to be increasing in thickness, and there was no wintering spot to aim for but Cape Armitage. 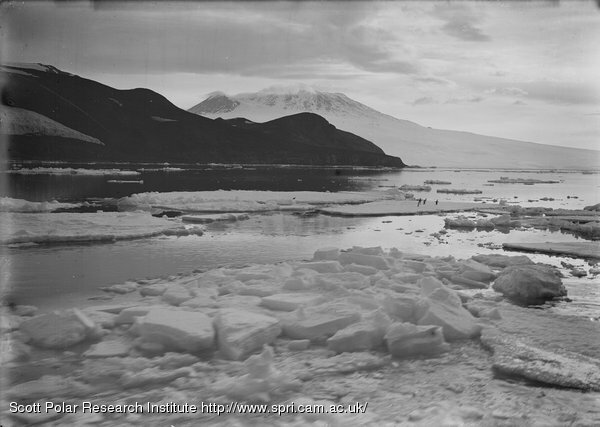 ‘I have never seen the ice of the Sound in such a condition or the land so free from snow. Taking these facts in conjunction with the exceptional warmth of the air, I came to the conclusion that it had been an exceptionally warm summer. At this point it was evident that we had a considerable choice of wintering spots. We could have gone to either of the small islands, to the mainland, the Glacier Tongue, or pretty well anywhere except Hut Point. My main wish was to choose a place that would not be easily cut off from the Barrier, and my eye fell on a cape which we used to call the Skuary a little behind us. 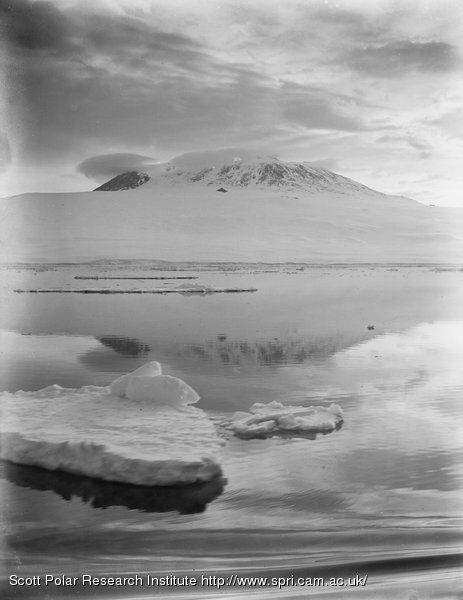 It was separated from old Discovery quarters by two deep bays on either side of the Glacier Tongue, and I thought that these bays would remain frozen until late in the season, and that when they froze over again the ice would soon become firm.’ I called a council and put these propositions. 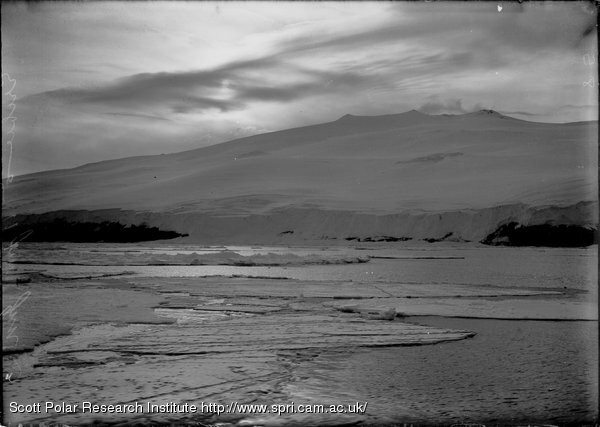 To push on to the Glacier Tongue and winter there; to push west to the ‘tombstone’ ice and to make our way to an inviting spot to the northward of the cape we used to call ‘the Skuary.’ I favoured the latter course, and on discussion we found it obviously the best, so we turned back close around Inaccessible Island and steered for the fast ice off the Cape at full speed. 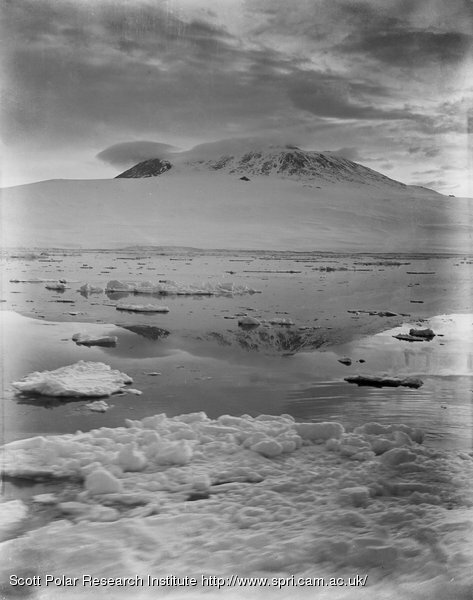 After piercing a small fringe of thin ice at the edge of the fast floe the ship’s stem struck heavily on hard bay ice about a mile and a half from the shore. Here was a road to the Cape and a solid wharf on which to land our stores. We made fast with ice anchors. Wilson, Evans, and I went to the Cape, which I had now rechristened Cape Evans in honour of our excellent second in command. A glance at the land showed, as we expected, ideal spots for our wintering station. The rock of the Cape consists mainly of volcanic agglomerate with olivine kenyte; it is much weathered and the destruction had formed quantities of coarse sand. We chose a spot for the hut on a beach facing N.W. and well protected by numerous small hills behind. This spot seems to have all the local advantages (which I must detail later) for a winter station, and we realised that at length our luck had turned. The most favourable circumstance of all is the stronge chance of communication with Cape Armitage being established at an early date. 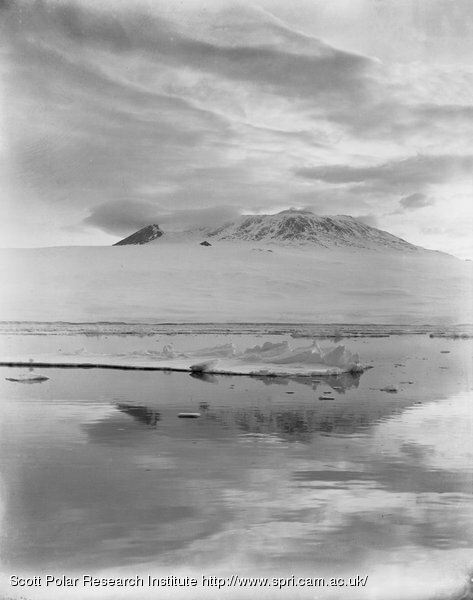 It was in connection with this fact that I had had such a strong desire to go to Mount Terror, and such misgivings if we had been forced to go to Cape Royds. It is quite evident that the ice south of Cape Royds does not become secure till late in the season, probably in May. 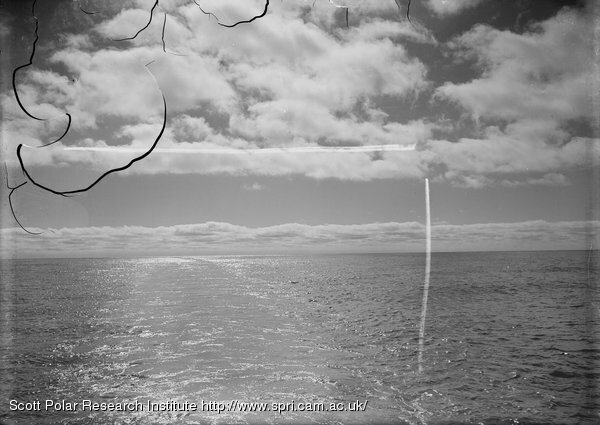 Before that, all evidence seems to show that the part between Cape Royds and Cape Barne is continually going out. How, I ask myself, was our depot party to get back to home quarters? 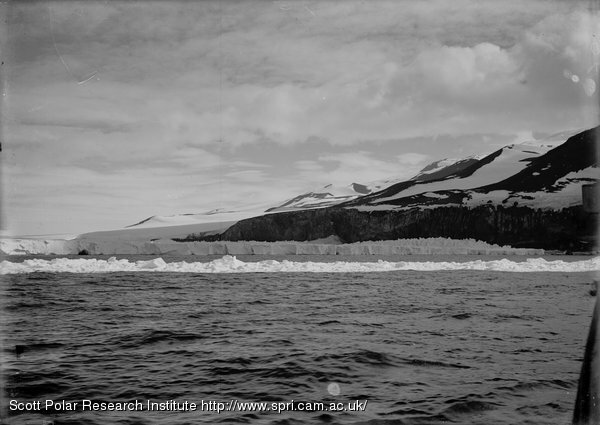 I feel confident we can get to the new spot we have chosen at a comparatively early date; it will probably only be necessary to cross the sea ice in the deep bays north and south of the Glacier Tongue, and the ice rarely goes out of there after it has first formed. Even if it should, both stages can be seen before the party ventures upon them. After many frowns fortune has treated us to the kindest smile–for twenty-four hours we have had a calm with brilliant sunshine. Such weather in such a place comes nearer to satisfying my ideal of perfection than any condition that I have ever experienced. The warm glow of the sun with the keen invigorating cold of the air forms a combination which is inexpressibly health-giving and satisfying to me, whilst the golden light on this wonderful scene of mountain and ice satisfies every claim of scenic magnificence. No words of mine can convey the impressiveness of the wonderful panorama displayed to our eyes. Ponting is enraptured and uses expressions which in anyone else and alluding to any other subject might be deemed extravagant. 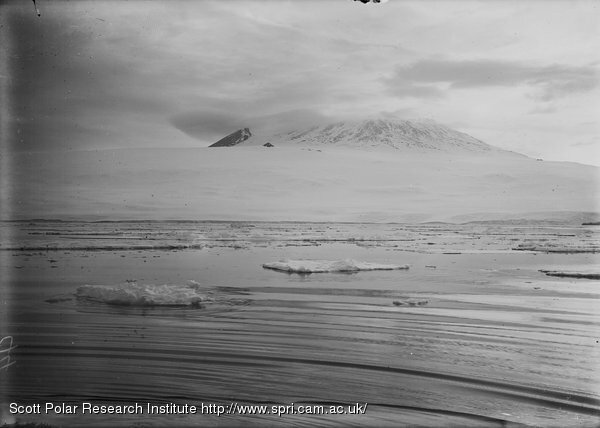 Whilst we were on shore Campbell was taking the first steps towards landing our stores. Two of the motor sledges were soon hoisted out, and Day with others was quickly unpacking them. Our luck stood again. 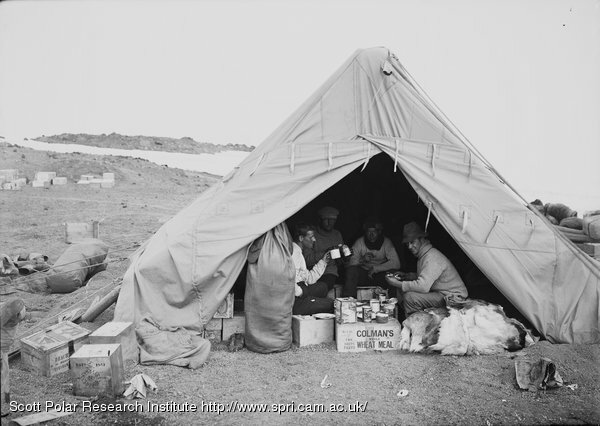 In spite of all the bad weather and the tons of sea water which had washed over them the sledges and all the accessories appeared as fresh and clean as if they had been packed on the previous day–much credit is due to the officers who protected them with tarpaulins and lashings. After the sledges came the turn of the ponies–there was a good deal of difficulty in getting some of them into the horse box, but Oates rose to the occasion and got most in by persuasion, whilst others were simply lifted in by the sailors. Though all are thin and some few looked pulled down I was agreeably surprised at the evident vitality which they still possessed–some were even skittish. I cannot express the relief when the whole seventeen were safely picketed on the floe. From the moment of getting on the snow they seemed to take a new lease of life, and I haven’t a doubt they will pick up very rapidly. It really is a triumph to have got them through safely and as well as they are. Poor brutes, how they must have enjoyed their first roll, and how glad they must be to have freedom to scratch themselves! It is evident all have suffered from skin irritation–one can imagine the horror of suffering from such an ill for weeks without being able to get at the part that itched. I note that now they are picketed together they administer kindly offices to each other; one sees them gnawing away at each other’s flanks in most amicable and obliging manner. 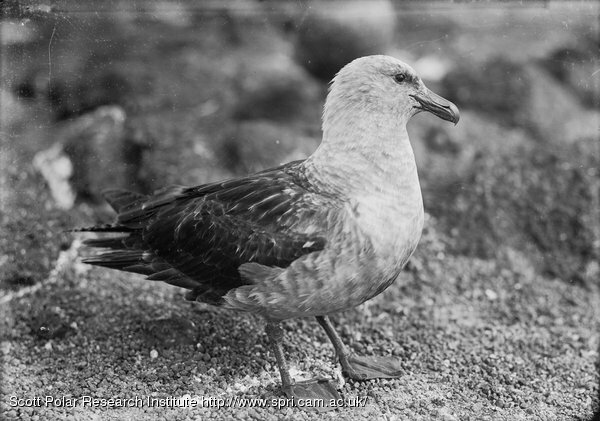 With the first spilling of blood the skua gulls assemble, and soon, for them at least, there is a gruesome satisfaction to be reaped. Oddly enough, they don’t seem to excite the dogs; they simply alight within a few feet and wait for their turn in the drama, clamouring and quarrelling amongst themselves when the spoils accrue. Such incidents were happening constantly to-day, and seriously demoralising the dog teams. Meares was exasperated again and again. The motor sledges were running by the afternoon, Day managing one and Nelson the other. In spite of a few minor breakdowns they hauled good loads to the shore. It is early to call them a success, but they are certainly extremely promising. The next thing to be got out of the ship was the hut, and the large quantity of timber comprising it was got out this afternoon. And so to-night, with the sun still shining, we look on a very different prospect from that of 48 or even 24 hours ago. I have just come back from the shore. 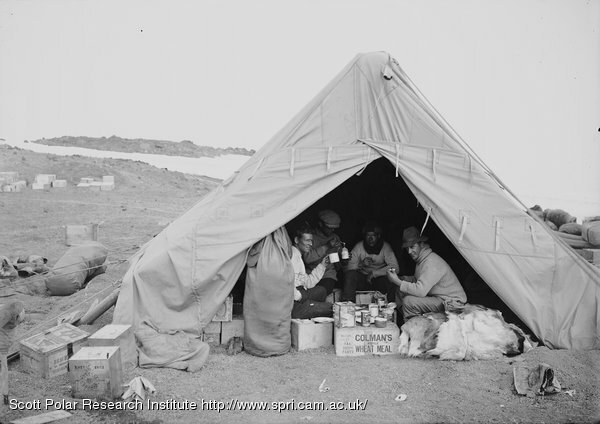 The site for the hut is levelled and the erecting party is living on shore in our large green tent with a supply of food for eight days. Nearly all the timber, &c., of the hut is on shore, the remainder half-way there. The ponies are picketed in a line on a convenient snow slope so that they cannot eat sand. 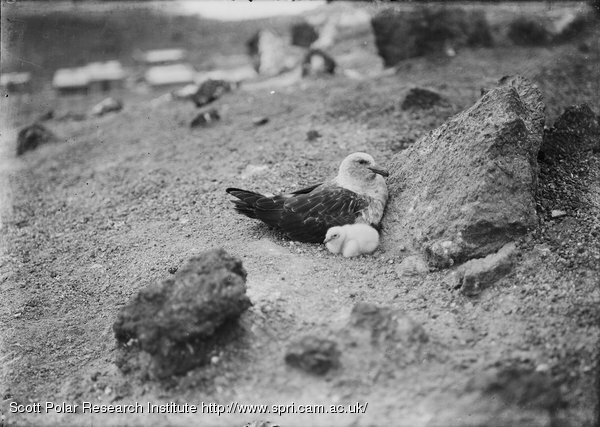 Oates and Anton are sleeping ashore to watch over them. The dogs are tied to a long length of chain stretched on the sand; they are coiled up after a long day, looking fitter already. Meares and Demetri are sleeping in the green tent to look after them. A supply of food for ponies and dogs as well as for the men has been landed. Two motor sledges in good working order are safely on the beach. A fine record for our first day’s work. All hands start again at 6 A.M. to-morrow. It’s splendid to see at last the effect of all the months of preparation and organisation. There is much snoring about me as I write (2 P.M.) from men tired after a hard day’s work and preparing for such another to-morrow. I also must sleep, for I have had none for 48 hours – but it should be to dream happily. 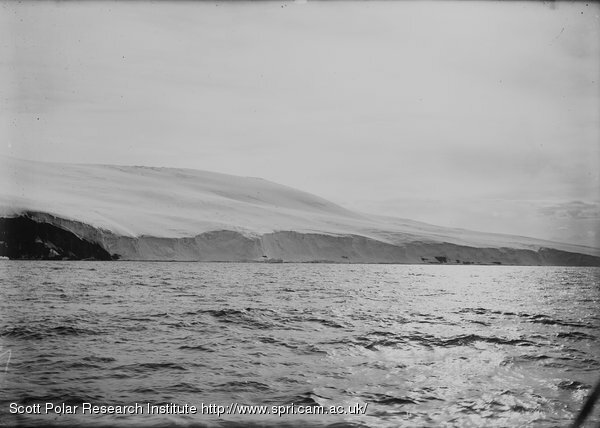 The steep exposed hill sides on the west side of Cape Bird look like high cliffs as one gets south of them and form a most conspicuous land mark. 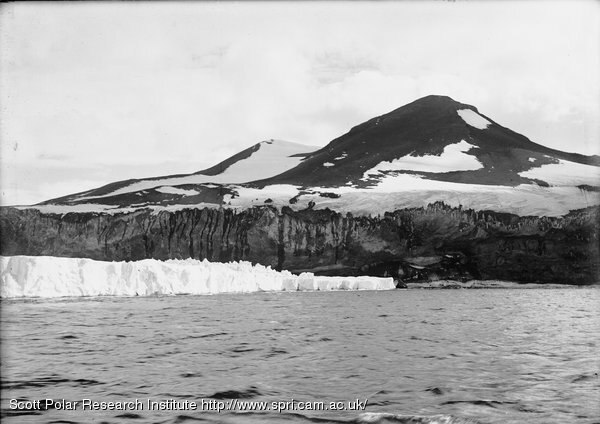 We pushed past these cliffs into streams of heavy bay ice, making fair progress; as we proceeded the lanes became scarcer, the floes heavier, but the latter remain loose. 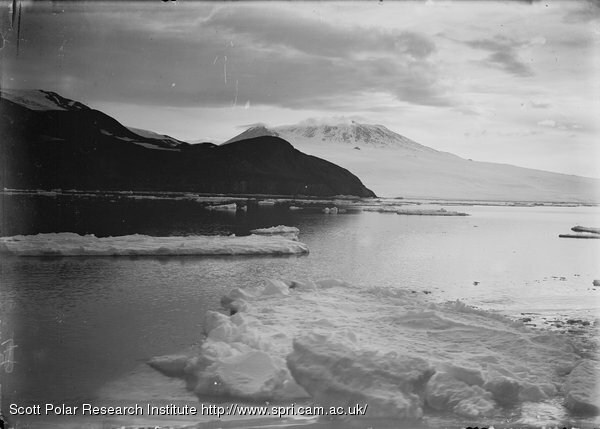 ‘Many of us spent the night on deck as we pushed through the pack.’ We have passed some very large floes evidently frozen in the strait. This is curious, as all previous evidence has pointed to the clearance of ice sheets north of Cape Royds early in the spring. I have observed several floes with an entirely new type of surface. 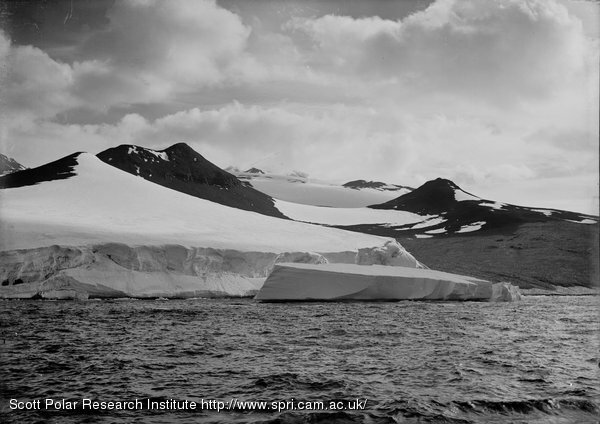 They are covered with scales, each scale consisting of a number of little flaky ice sheets superimposed, and all ‘dipping’ at the same angle. It suggests to me a surface with sastrugi and layers of fine dust on which the snow has taken hold. 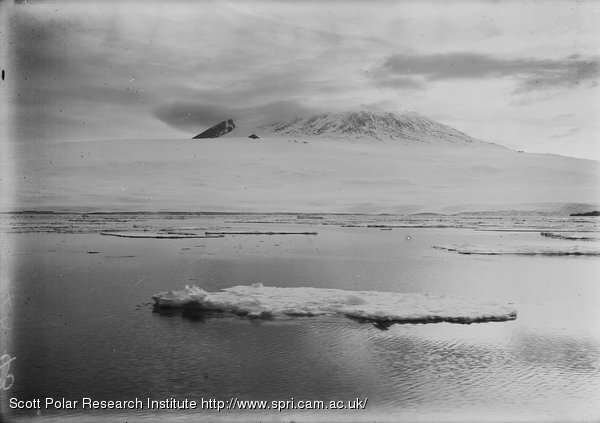 We are within 5 miles of Cape Royds and ought to get there. 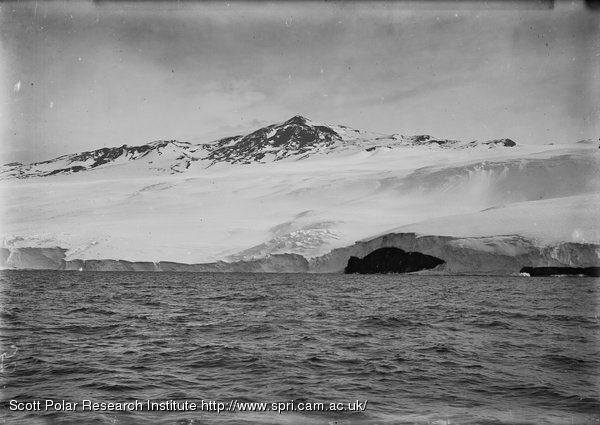 We are around Cape Bird and in sight of our destination, but it is doubtful if the open water extends so far. 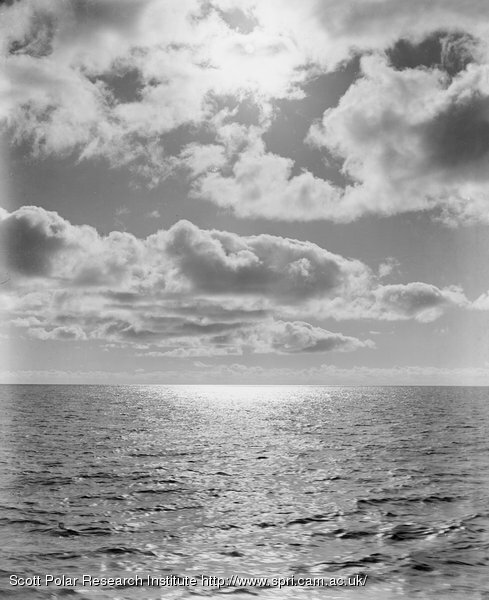 We have advanced by following an open water lead close along the land. Cape Bird is a very rounded promontory with many headlands; it is not easy to say which of these is the Cape. 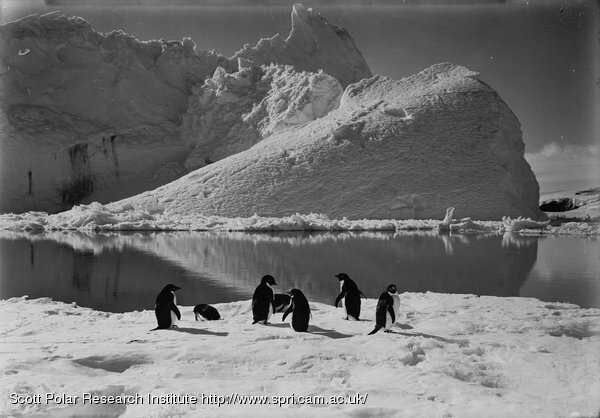 The same grim unattainable ice-clad coast line extends continuously from the Cape Crozier Rookery to Cape Bird. 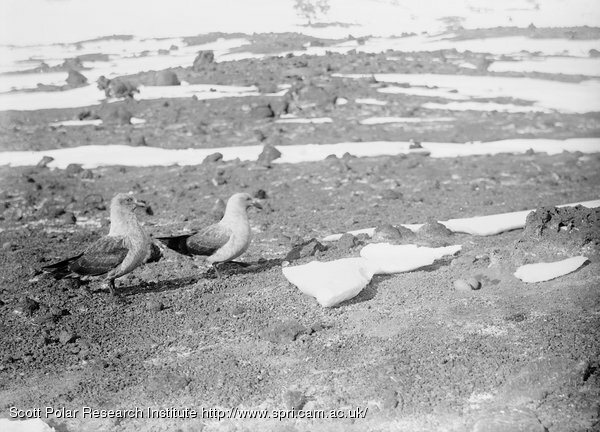 West of C. Bird there is a very extensive expanse of land, and on it one larger and several small penguin rookeries. 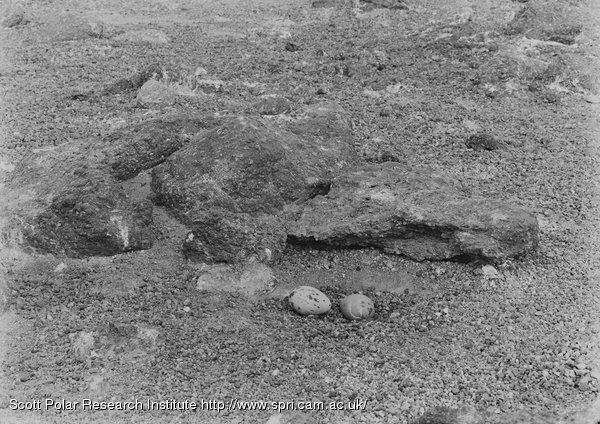 On the uniform dark reddish brown of the land can be seen numerous grey spots; these are erratic boulders of granite. Through glasses one could be seen perched on a peak at least 1300 feet above the sea. Another group of killer whales were idly diving off the penguin rookery; an old one with a very high straight dorsal fin and several youngsters. 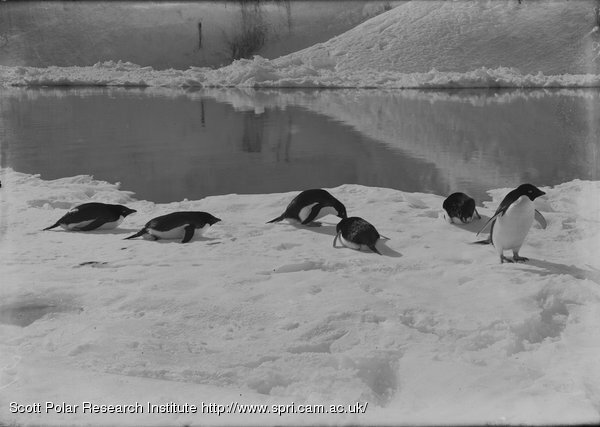 We watched a small party of penguins leaping through the water towards their enemies. 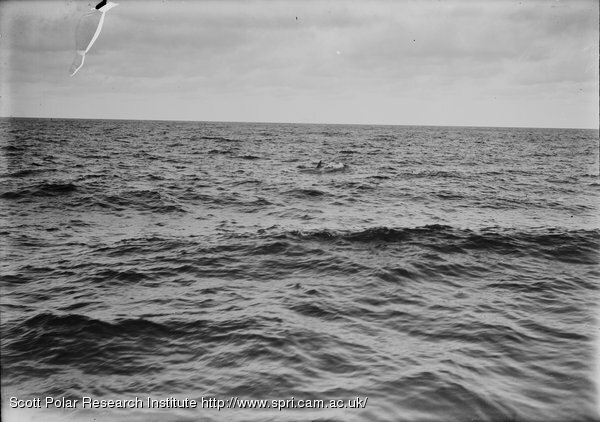 It seemed impossible that they should have failed to see the sinister fins during their frequent jumps into the air, yet they seemed to take no notice whatever – stranger still, the penguins must have actually crossed the whales, yet there was no commotion whatever, and presently the small birds could be seen leaping away on the other side. One can only suppose the whales are satiated. 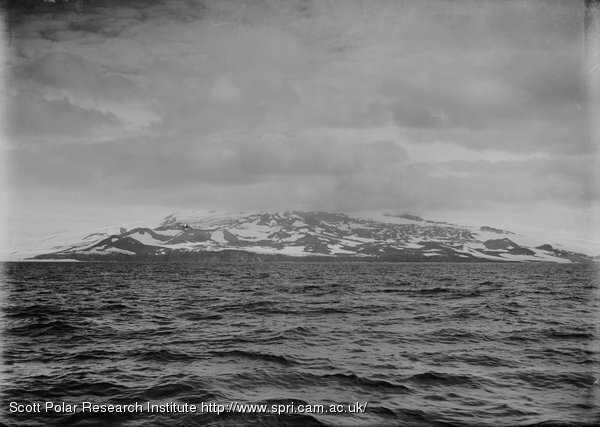 As we rounded Cape Bird we came in sight of the old well-remembered land marks – Mount Discovery and the Western Mountains – seen dimly through a hazy atmosphere. It was good to see them again, and perhaps after all we are better this side of the Island. It gives one a homely feeling to see such a familiar scene. 10.30. 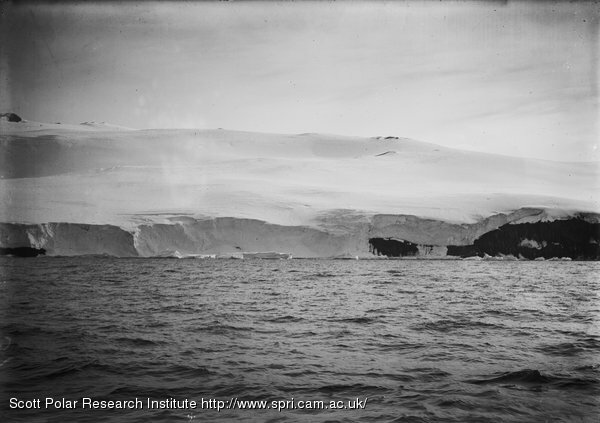 We find pack off Cape Bird; we have passed through some streams and there is some open water ahead, but I’m afraid we may find the ice pretty thick in the Strait at this date. 6 P.M. No good!! Alas! Cape Crozier with all its attractions is denied us. We came up to the Barrier five miles east of the Cape soon after 1 P.M. The swell from the E.N.E. continued to the end. The Barrier was not more than 60 feet in height. From the crow’s nest one could see well over it, and noted that there was a gentle slope for at least a mile towards the edge. The land of Black (or White?) 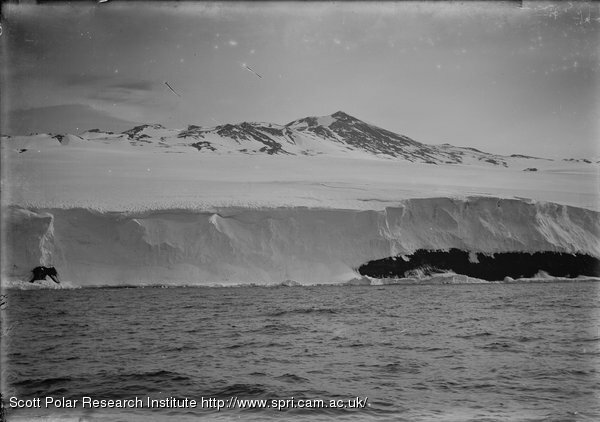 Island could be seen distinctly behind, topping the huge lines of pressure ridges. 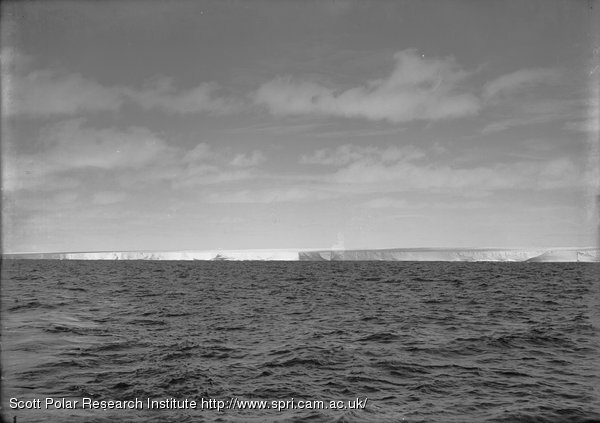 We plotted the Barrier edge from the point at which we met it to the Crozier cliffs; to the eye it seems scarcely to have changed since Discovery days, and Wilson thinks it meets the cliff in the same place. The Barrier takes a sharp turn back at 2 or 3 miles from the cliffs, runs back for half a mile, then west again with a fairly regular surface until within a few hundred yards of the cliffs; the interval is occupied with a single high pressure ridge – the evidences of pressure at the edge being less marked than I had expected. Ponting was very busy with cinematograph and camera. In the angle at the corner near the cliffs Rennick got a sounding of 140 fathoms and Nelson some temperatures and samples. When lowering the water bottle on one occasion the line suddenly became slack at 100 metres, then after a moment’s pause began to run out again. We are curious to know the cause, and imagine the bottle struck a seal or whale. 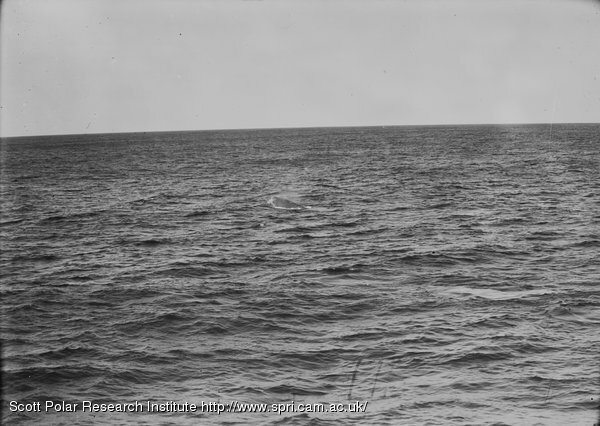 Meanwhile, one of the whale boats was lowered and Wilson, Griffith Taylor, Priestley, Evans, and I were pulled towards the shore. 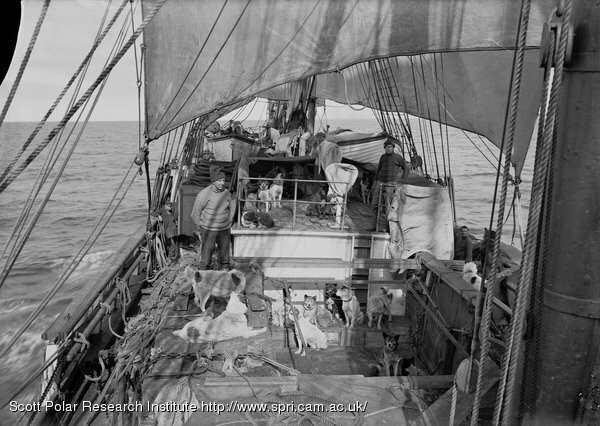 The after-guard are so keen that the proper boat’s crew was displaced and the oars manned by Oates, Atkinson, and Cherry-Garrard, the latter catching several crabs. The swell made it impossible for us to land. I had hoped to see whether there was room to pass between the pressure ridge and the cliff, a route by which Royds once descended to the Emperor rookery; as we approached the corner we saw that a large piece of sea floe ice had been jammed between the Barrier and the cliff and had buckled up till its under surface stood 3 or 4 ft. above the water. 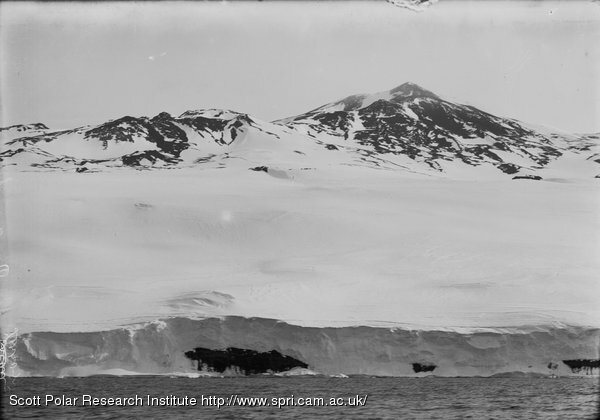 On top of this old floe we saw an old Emperor moulting and a young one shedding its down. 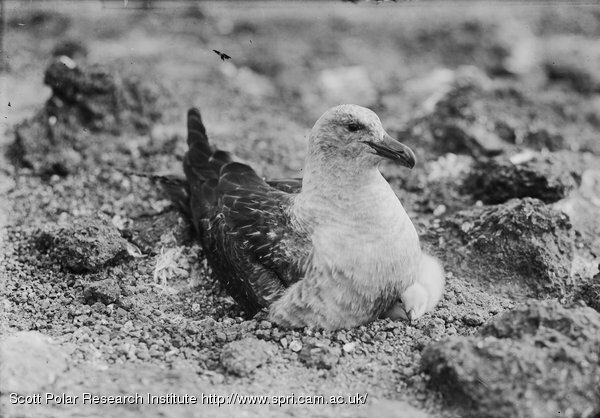 (The down had come off the head and flippers and commenced to come off the breast in a vertical line similar to the ordinary moult.) 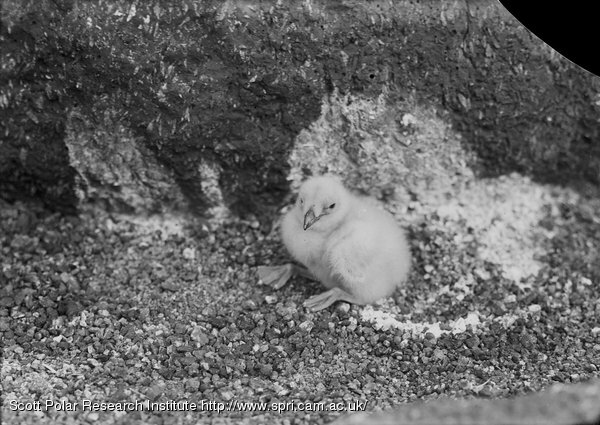 This is an age and stage of development of the Emperor chick of which we have no knowledge, and it would have been a triumph to have secured the chick, but, alas! there was no way to get at it. 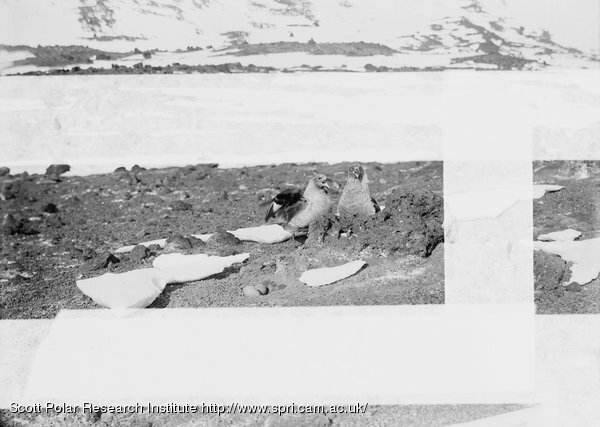 Another most curious sight was the feet and tails of two chicks and the flipper of an adult bird projecting from the ice on the under side of the jammed floe; they had evidently been frozen in above and were being washed out under the floe. Finding it impossible to land owing to the swell, we pulled along the cliffs for a short way. These Crozier cliffs are remarkably interesting. The rock, mainly volcanic tuff, includes thick strata of columnar basalt, and one could see beautiful designs of jammed and twisted columns as well as caves with whole and half pillars very much like a miniature Giant’s Causeway. Bands of bright yellow occurred in the rich brown of the cliffs, caused, the geologists think, by the action of salts on the brown rock. In places the cliffs overhung. In places, the sea had eaten long low caves deep under them, and continued to break into them over a shelving beach. Icicles hung pendant everywhere, and from one fringe a continuous trickle of thaw water had swollen to a miniature waterfall. It was like a big hose playing over the cliff edge. We noticed a very clear echo as we passed close to a perpendicular rock face. Later we returned to the ship, which had been trying to turn in the bay–she is not very satisfactory in this respect owing to the difficulty of starting the engines either ahead or astern–several minutes often elapse after the telegraph has been put over before there is any movement of the engines. It makes the position rather alarming when one is feeling one’s way into some doubtful corner. When the whaler was hoisted we proceeded round to the penguin rookery; hopes of finding a quiet landing had now almost disappeared. There were several small grounded bergs close to the rookery; going close to these we got repeated soundings varying from 34 down to 12 fathoms. There is evidently a fairly extensive bank at the foot of the rookery. 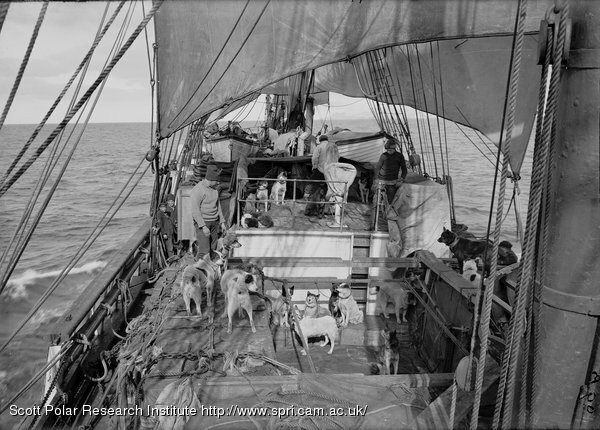 There is probably good anchorage behind some of the bergs, but none of these afford shelter for landing on the beach, on which the sea is now breaking incessantly; it would have taken weeks to land the ordinary stores and heaven only knows how we could have got the ponies and motor sledges ashore. Reluctantly and sadly we have had to abandon our cherished plan – it is a thousand pities. Every detail of the shore promised well for a wintering party. 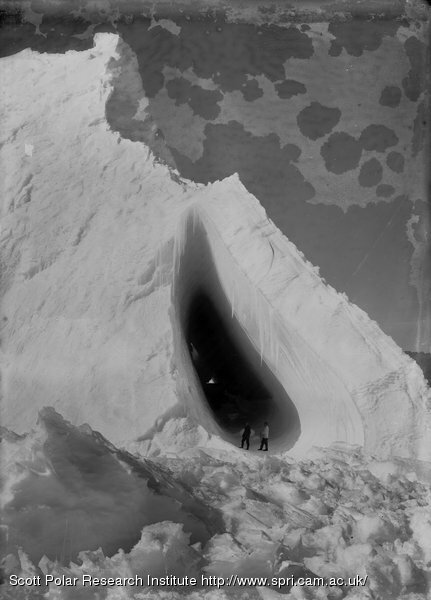 Comfortable quarters for the hut, ice for water, snow for the animals, good slopes for ski-ing, vast tracks of rock for walks. 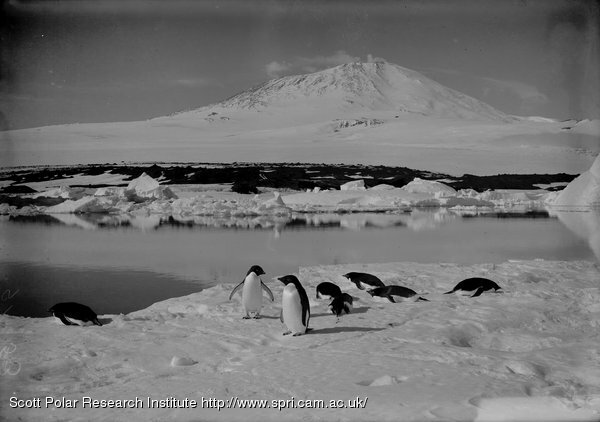 Proximity to the Barrier and to the rookeries of two types of penguins – easy ascent of Mount Terror – good ground for biological work – good peaks for observation of all sorts – fairly easy approach to the Southern Road, with no chance of being cut off – and so forth. It is a thousand pities to have to abandon such a spot. On passing the rookery it seemed to me we had been wrong in assuming that all the guano is blown away. I think there must be a pretty good deposit in places. The penguins could be seen very clearly from the ship. 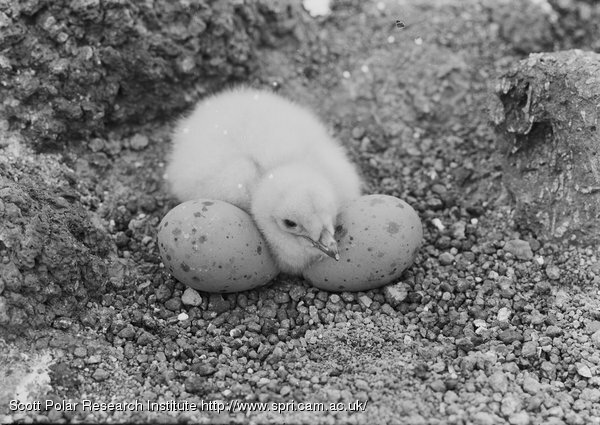 On the large rookery they occupy an immense acreage, and one imagines have extended as far as shelter can be found. But on the small rookery they are patchy and there seems ample room for the further extension of the colonies. Such unused spaces would have been ideal for a wintering station if only some easy way could have been found to land stores. 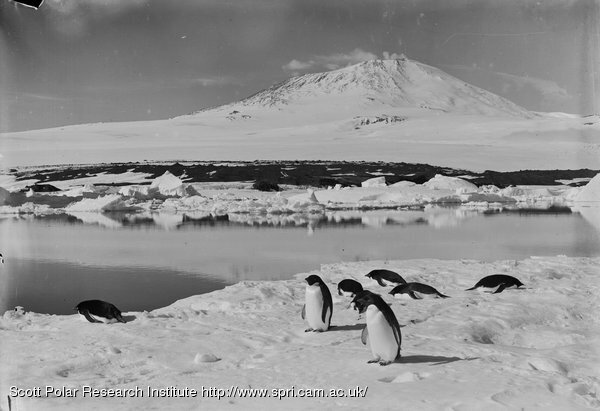 I noted many groups of penguins on the snow slopes over-looking the sea far from the rookeries, and one finds it difficult to understand why they meander away to such places. A number of killer whales rose close to the ship when we were opposite the rookery. 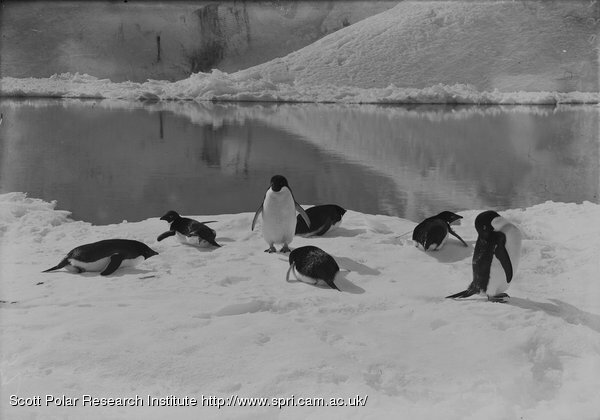 What an excellent time these animals must have with thousands of penguins passing to and fro! We saw our old Discovery post-office pole sticking up as erect as when planted, and we have been comparing all we have seen with old photographs. No change at all seems to have taken place anywhere, and this is very surprising in the case of the Barrier edge. 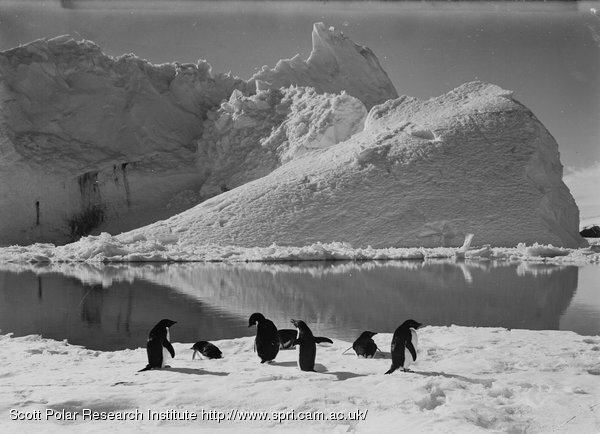 From the penguin rookeries to the west it is a relentless coast with high ice cliffs and occasional bare patches of rock showing through. 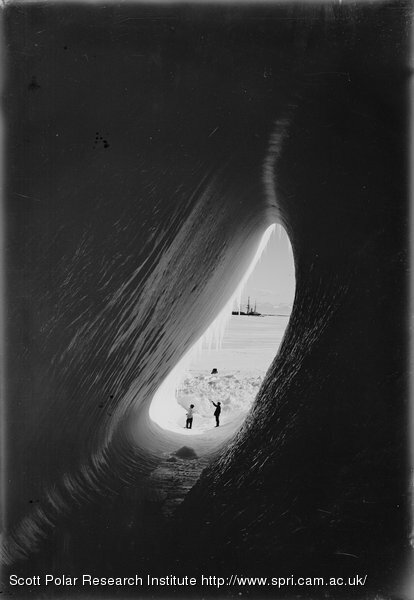 Even if landing were possible, the grimmest crevassed snow slopes lie behind to cut one off from the Barrier surface; there is no hope of shelter till we reach Cape Royds. Meanwhile all hands are employed making a running survey. I give an idea of the programme opposite. 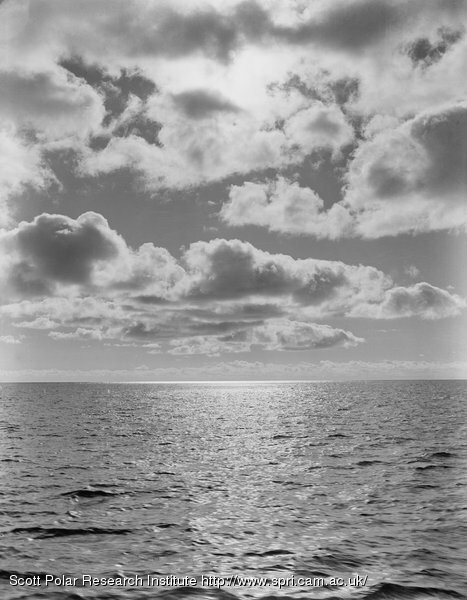 Terror cleared itself of cloud some hours ago, and we have had some change in views of it. It is quite certain that the ascent would be easy. 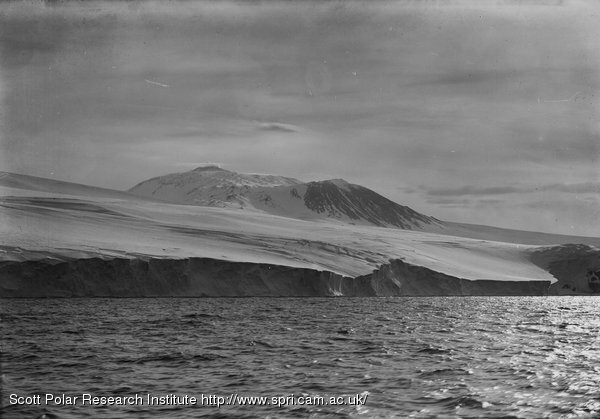 The Bay on the north side of Erebus is much deeper than shown on the chart. The sun has been obstinate all day, peeping out occasionally and then shyly retiring; it makes a great difference to comfort. Bruce continually checking speed with hand log. Bowers taking altitudes of objects as they come abeam. Nelson noting results. Pennell taking verge plate bearings on bow and quarter. Cherry-Garrard noting results. Evans taking verge plate bearings abeam. Atkinson noting results. 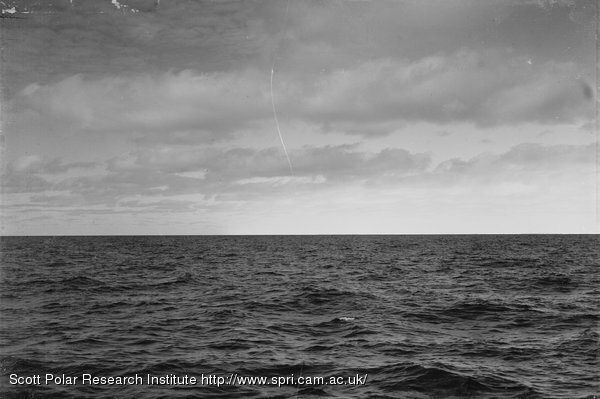 Campbell taking distances abeam with range finder. Wright noting results. Rennick sounding with Thomson machine. Drake noting results. Beaufort Island looks very black from the south. 10 A.M. The conditions are very much the same as last night. 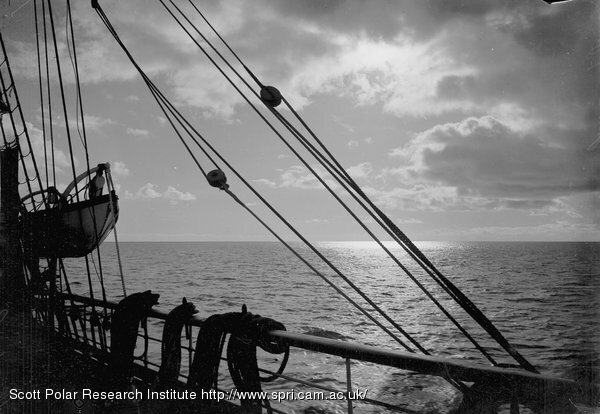 We are only 24 miles from C. Crozier and the land is showing up well, though Erebus is veiled in stratus cloud. It looks finer to the south and we may run into sunshine soon, but the wind is alarming and there is a slight swell which has little effect on the ship, but makes all the difference to our landing. For the moment it doesn’t look hopeful. We have been continuing our line of soundings. From the bank we crossed in latitude 71º the water has gradually got deeper, and we are now getting 310 to 350 fathoms against 180 on the bank. 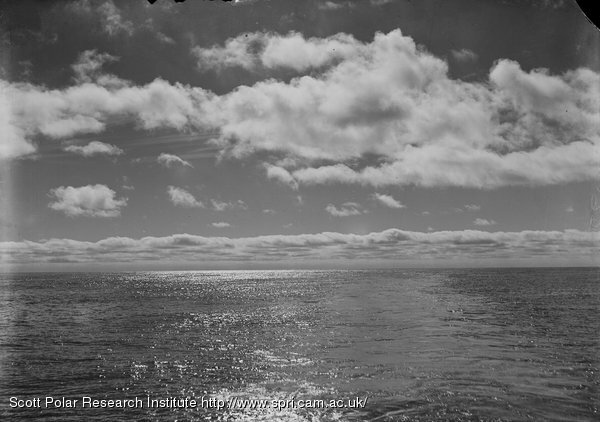 The Discovery soundings give depths up to 450 fathoms East of Ross Island. It has been a glorious night followed by a glorious forenoon; the sun has been shining almost continuously. 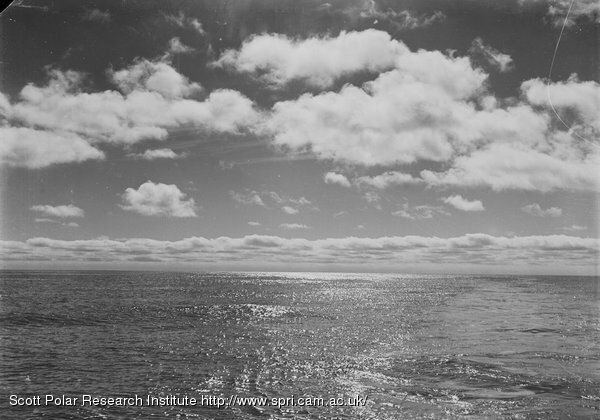 Several of us drew a bucket of sea water and had a bath with salt water soap on the deck. The water was cold, of course, but it was quite pleasant to dry oneself in the sun. 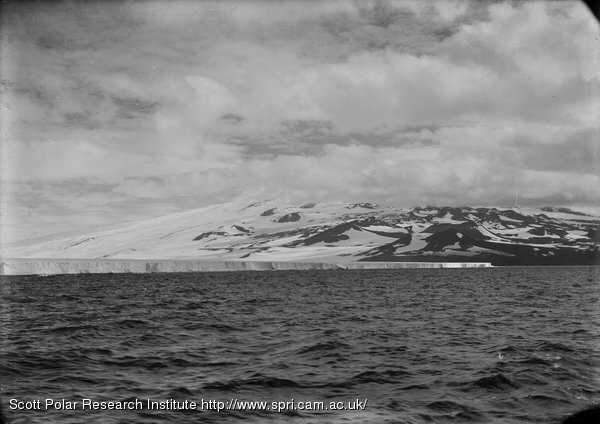 The deck bathing habit has fallen off since we crossed the Antarctic circle, but Bowers has kept going in all weathers. There is still a good deal of swell – difficult to understand after a day’s calm – and less than 200 miles of water to wind-ward. Wilson saw and sketched the new white stomached whale seen by us in the pack. 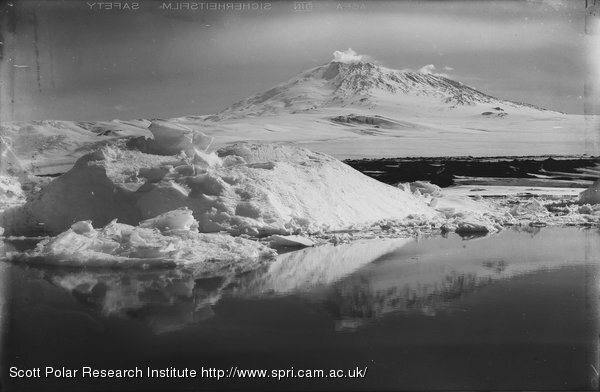 At 8.30 we sighted Mount Erebus, distant about 115 miles; the sky is covered with light cumulus and an easterly wind has sprung up, force 2 to 3. With all sail set we are making very good progress. Obs. 75º 3′, 173º 41′. Made good S. 3 W. 119′; C. Crozier S. 22 W. 159′.